Thanks to Target’s unaccommodating return policy, you probably had to put your pile of cult costumes in a garage sale. You felt lucky to get a buck each for them. If your family’s token giver of bad gifts monogrammed those matching His and Hers Snuggies, then you probably felt obligated to keep them. With your initials on them, those Snuggies have zero value. Cheap, synthetic fleece manufactured in China doesn’t absorb water very well, so you can’t wash your car with them. That inaugural rant about Snuggies paved the way for other posts about bad products. The Hug Me Pillow, Peekaru, and the Buzz Lightyear Funtime Tumbler all had me shaking my head and wondering just how long the United States of America can survive. Then again, the entrepreneur who sold jewelry made from the ashes of dead pets was Japanese. Like poison ivy, bad products start somewhere and pop up all over the place. Several days ago, my friend Catherine sent me a link to a commercial on YouTube for a new product called Forever Lazy. These frumpy fleece coveralls win the award for Latest Clothing Gimmick Guaranteed To Sell Like Hotdogs At A Football Game. What this adult onesie has in common with other shockingly stupid products is what such items truly cost the buyerâ€”not $29.95 plus Shipping and Handling but dignity. If you aren’t ashamed to wear one of these, then you lost your self-respect a long time ago, probably during a drinking binge during college. We’ve come to expect ludicrous selling points in infomercials, but the Forever Lazy sets a new standard for marketing mediocrity. Blankets aren’t mortal foes. They are sheets of fabric that lays on top of your body wherever you put it. When you want no longer want the blanket, you throw it off you. It’s really that simple. Blankets aren’t fishing nets or bad girlfriends. If I want to stay warm, I can use the heater in my house. If I can’t afford my utilities bill, I obviously have more pressing concerns that trying to save money by wasting it on tasteless clothing. Another thing: the word one-piece should only come up when grandmas discuss bathing suits. If a business has to create a new categoryâ€”â€œlazywearâ€â€”to give its garments a reason to exist, then it should also invest in landfills. That’s where the products will end up, and you know that synthetic fleece won’t biodegrade for several million years. This business model would be helpful for other businesses as well. Krystal could sell both gut-bomb burgers and antacids. A group of guys watching a football game in fleece onesies? This doesn’t happen. This whole scene is a farce. I sometimes watch football with friends. What do I wear? Jeans and a shirt. What do they wear? Jeans and a shirt. As a grown man, I avoid doing my business out of â€œhatches.â€ I don’t wear unitards. I don’t wear singlets. I might wear a wetsuit if I were in cold water or coveralls if I were going skydiving or working on engines. I’ll wear chest waders when I’m fly fishing in the fall and winter. The only time I would ever justify evacuating any organ through a hatch would be if I were living in the International Space Station. Astronauts can wear diapers and throw snowballs at the Queen of England because they’re that cool. But when the urge strikes the rest of us, the simple method will suffice, dropping our trousers. Since when was using the restroom difficult? 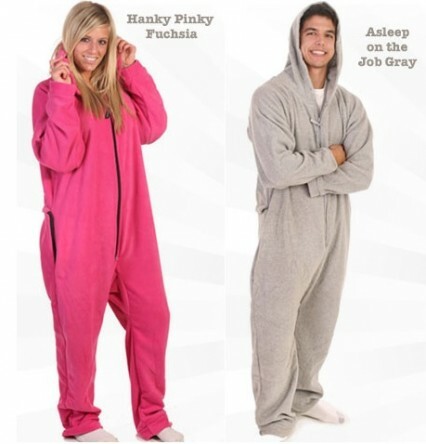 Maybe Forever Lazy can also feed me a bottle and wipe my bottom. Maybe it could clip fingernails and wipe spittle from my chin. Is anyone really that lazy? I don’t need hatches. I am a man. I have two hands to undo buttons and unzip zippers. Anytime I need to relieve myself, I am happy to spend five seconds to perform this simple action, and if I lose that ability, I will pay someone else to help me. Keeping my self-respect will be worth the expense. If I ever make the decision to dress like a slob, I’ll do it the old-fashioned way in gray sweat pants with elastic in the ankles and t-shirts greasy with fried chicken. The informercial insults our intelligence. All the people in it are attractive. They’re actors and models. In other words, these are the last people who would swaddle themselves, eat Spam, and watch campy horror movies. The people behind Forever Lazy should be made to wear these baggy, beltless blights as punishment for their avarice and stupidity. This entry was written by austinlchurch, posted on October 28, 2011 at 10:34 am, filed under bad products, comic relief and tagged bad products, Buzz Lightyear Funtime Tumbler, forever lazy, Hug Me Pillow, Peekaru, stupid products. Bookmark the permalink. Follow any comments here with the RSS feed for this post. Both comments and trackbacks are currently closed.